is a peer reviewed scholarly archival journal of the IEEE Computer Society, published monthly with a wide distribution to researchers, developers, technical managers, and educators in the computer field. is�the honor society of IEEE, is dedicated to encouraging and recognizing individual excellence in education and meritorious work, in professional practice, and in any of the areas within the IEEE-designated fields of interest. is�the first Italian (and European) chapter of IEEE-Eta Kappa Nu (HKN), at Politecnico di Torino.�Its activities range from educational tutoring to the organization of events such as workshops and seminars, with the aim of improving our skills and helping out our colleagues. He is serving as 2019 Acting (interim) Editor-in-Chief of the IEEE Transactions on Emerging Topics in Computing. He is currently serving as the 2017-19 IEEE Computer Society Awards Chair, first non-USA Committee Chair in the story (since 1955) of the Awards of the IEEE Computer Society. He is also �serving as a�Member of the Advisory Board of�Computing Now,�as a Member of the Publications Board of the Computer Society and a Vice Chair (for 2019) of the Computer Society Fellows Committee. In the IEEE he is also serving as a Member-at-Large of the Publication Services and Products Board (PSPB) (2015-2017 and 2018-2020), as Chair of�its�Strategic Planning Committee (2019), as a�member of the 2019�TAB/PSPB Ad Hoc Committee on Joint Publications Strategy, as a member of the 2019�IEEE Strategy and Alignment Ad Hoc Committee, and as a Member of the�IEEE TAB Awards and Recognition Committee (TABARC). He also served as�Vice Chair of the�2016 and 2017 IEEE Computer Society Fellows Committee,�Chair of the�Computer Society Technical Achievement Award Subcommittee�(2015-16),�Chair of the Magazine Operations, the Electronic Products and Services and the Digital Library Operations �Committees, Member of Electronic Products and Services Committee, Member-at-Large of the Computer Society’s Publications Board, Member of the Conference Publications Operations Committee, Member of�the Nominations Committee, and�Member of the Board of Governors of the IEEE Computer Society. In the IEEE he served as a Member of: the�Publication Services and Products Board representing The Institute�(2014), the TAB/PSPB Products and Services Committee (2014-2016), the PSPB Nominations and Appointments Committee (2015-16), the Strategic Planning Committee of�the IEEE Publication Services and Products Board, and the IEEE TAB Awards and Recognition Committee (TABARC, 2014, 2017). He served as Guest/Associate Editor and Associate Editor in Chief of the IEEE Transactions on Computers from 2000 to 2004, from 2009 to 2012 and from 2013 to 2014,�Member of the steering committee and an Associate Editor of the�IEEE Transactions on Emerging Topics in Computing�(2013-2015, 2018),�and Co-Chair, Program and Steering Committee Member of several conferences. His current main research interests and scientific achievements are in computer arithmetic, computer architectures, computer graphics, electronic publications, semantics & education, and new frameworks for the dissemination of scientific knowledge. He is a Fellow of the IEEE and a IEEE Computer Society Golden Core Member. He is a life Member of the International Academy of Sciences of Turin. He has received the IEEE Computer Society Distinguished Service Award, which is�the highest service award in recognition for long and distinguished service to the IEEE Computer Society at a level of dedication and achievement rarely demonstrated. In 2015 he has been admitted into Life Membership of�Eta Kappa Nu, the Honor Society of IEEE. In 2016, he served as Co-General-Chair (with Dr. Mike Schulte of AMD) of the 23rd IEEE Symposium on Computer Arithmetic.�At the February 2016 Board of Governors Meeting of the Computer Society, he has received a "Spirit," award for exemplifying the Spirit of the Computer Society by the achievements obtained while serving as Editor-in-Chief, and Chair/Member of several Computer Society and IEEE committees. 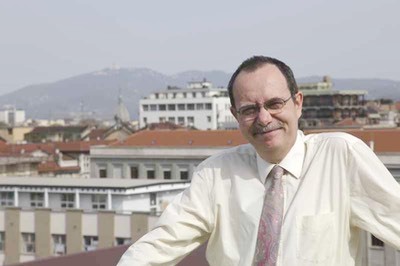 Montuschi�obtained a PhD in computer�engineering in 1989, and since January 1, 2000 he has been full Professor. For the most recently updated information on his services and appointments in the IEEE and the Computer Society, please follow this�link. Disclaimer.�The opinions expressed on this website are the opinions of the author and not necessarily the opinions of the IEEE.